News Pertaining to Hawaiian Dogs. 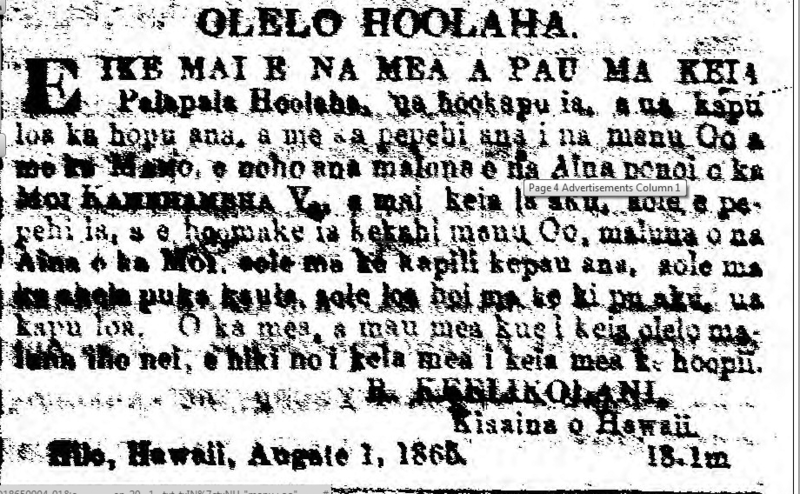 Catching Oo in Hamakua, 1866. The Pacific Commercial Advertiser, Volume XIX, Number 14, Page 3. October 3, 1874. Some fish prices rose a little, and some decreased. Kalekale went from 55 to 65 cents. Opihi went from 30 to 40 cents. Awa, fillet, from 45 to 50 cents. Ulua over 20 pounds, from 55 to 45 cents. Aku fillet, ocean anae, papiopio, whole ulua under 20 pounds, 55 cents per pound. Ahi fillet, and moi from 55 to 50 cents. A’u fillet, kalekale, moano, opakapaka, u-u, from 55 to 45 cents. Aholehole, from 50 to 45 cents. Whole aku, kupipi from 40 to 35 cents. Opelu from 45 to 35 cents. Humuhumu from 35 to 25 cents. Pond anae, from 60 to 55 cents. Kole from 40 to 18 cents. Palani, Pualu, from 35 cents to 18 cents. Akule from 50 cents to 35 cents. We see that the price of some fish are indeed low while some are higher. We have no criticisms about some, and over some we will just keep our mouths shut, for that is under their control. Know you fishermen the prices shown above, so that you know the prices of all the different fishes, lest you go beyond it and end up without profit. Ka Hoku o Hawaii, Volume XXXVIII, Number 22, Aoao 1. Sepatemaba 22, 1943. Hawaiian birds and the law, 1865. KNOW YOU ALL BY THIS Announcement; prohibited totally is the catching and the killing of Oo and Mamo birds living on the personal lands of King Kamehameha V, and from this day forward, no Oo is to be injured or killed on the lands of the Monarch; not by using lime [ke kapili kepau ana], not by snaring [ka ahele puka kaula], not by shooting [ke ki pu ana]; it is totally kapu. The person or persons who go against the words above, they each can be prosecuted. Hilo, Hawaii, August 1, 1865. Ke Au Okoa, Buke I, Helu 20, Aoao 4. Sepatemaba 4, 1865. We received word from the news released by the Hui Manuihi [?? Audubon Society ??] that there are now at Kilauea many apapane birds, and it is the one bird that is most widespread there. Just like the work of those who research all sorts of things, there are some who made a move to study the different birds, and not only in other places, but here in Hawaii as well. The activity of these people on Kilauea was to go into the forests to look at the Hawaiian Birds that are spread out there, and by them travelling the narrow paths in the Bird Park and entering into the Golf course and reaching the Soldier Camp at Kilauea and then arriving at Kilauea Iki; there were more Apapane than all the other birds put together. With the research of the rangers of Kilauea National Park, they saw there was a large amount of bugs on the trees these days and that is was has caused an increase in the birds, for that is what the birds eat. The number of kolea decreased and the mynah [piheekelo] birds are less, and it is believed because of the great cold. Other Hawaiian birds seen at Kilauea these days are the amakihi and the elepaio. Therefore according to this report shown, Hawaiian birds are indeed numerous, and the apapane is the most abundant. Ka Hoku o Hawaii, Volume XXXIII, Number 37, Aoao 2. Ianuari 11, 1939. Mr. Lydgate over on Kauai, recently saw a specimen of the native Hawaiian bat which was supposed to be extinct. There are other kinds of bats on Kauai and elsewhere, that are neither rare nor extinct. The Hawaiian Star, Volume XXII, Number 4004, Page 4. January 20, 1905.